A filter can be defined that hides parts of the tree. Enter the parent ID of the folder not visible in the partition. This ID can be ascertained from the database. For newly created folders, the tree control will enter this automatically into the "Parent key" field at the first level. 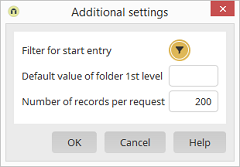 Only by entering the "Default value for folders on level 1" can the hierarchy of folders be correctly represented in the entire tree. Here, enter the number of data records that should be preloaded when a branch is opened. This entry increases performance when displaying levels that contain a large number of entries. The restriction entered here refers only to the initial loading of the records.